A trusted local florist, offers same-day floral delivery throughout Glendale, CA and surrounding areas, as well as nationwide delivery through its network of reliable florists. Specializes in Birthday Flowers, Anniversary Flowers, Get Well Flowers, Just Because Flowers, New Baby Flowers, Prom Flowers (Prom Boutonnieres, Prom Corsages), Sympathy & Funeral Flowers, Modern Flowers, Plants and Roses. Area covers for flower delivery services – 91206, 91226, 91224, 91011, 91214, 91201, 91210, 91204, 91020, 91012, 91205, 91207, 91221, 91202, 91222, 91208, 91225, 91203, 91209. One of the top flower shops in Glendale. Offers online and in-store ordering with same-day delivery on a wide variety of arrangements and gifts. Specialize in event design for Weddings, Funerals, Award Shows, Birthdays, Corporate Events, Mother’s Day, Valentine’s Day, Bar and Bat Mitzvahs, Christenings and other celebrations. Serves the entire metropolitan area including Beverly Hills, Burbank, Santa Monica, Bel Air, Culver City, Studio City, Sherman Oaks, Century City and Universal City, as well as all the major studios and agencies in Los Angeles. 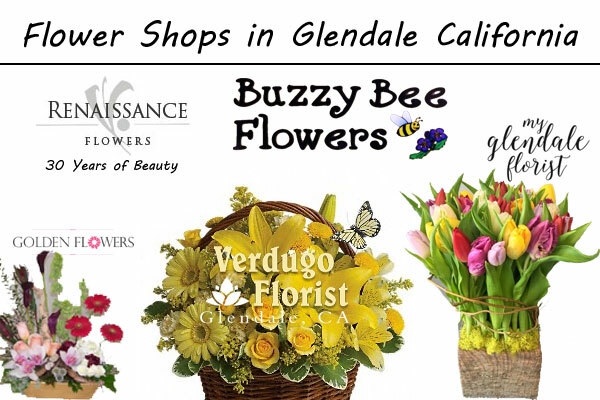 My Glendale Florist coupon code : Want to get discounted (15% off) online orders ? Visit Facebook page. Floral shop based in Glendale California. Offers online and in-store ordering of floral arrangements, gifts and mixed arrangement boxes with same day delivery options for weddings, bridal shower, sympathy, funeral and all other occasions. Flower shop in Central Ave Glendale. More than 30 years of experience. Offers floral arrangements for Weddings, Sympathy, Corporate, Home Decor, Everyday Arrangements and Roses. Specializes in wedding flowers Glendale CA. Flower shop and fresh flower delivery in Glendale, California. Specializing in weddings, quinceñeras, anniversaries, birthdays, sympathy flowers and more. Free local delivery. Speaks in English, Armenian and Spanish language. Armenian flower shops in Glendale CA. Lilit’s Flowers offers flower delivery in and around Glendale. Also provides same-day delivery for your important last minute gifts. Reliable same day flower delivery services in Glendale, CA. Offers online and in-store ordering of top quality flower arrangements and gifts for any occasion. Shop in-store or online all occasional fresh flower arrangements including Weddings, Anniversary, Birthday, Get Well, Just Because, Love & Romance, Make Someone Smile, New Baby, Summer Bouquets, Thank You, Sympathy, Wedding. Mon-Sun : 9:00 a.m. to 9:00 p.m. Same day flower shop and deliver service in Colorado Street Glendale, CA. Shop online or in-store for Weddings, Funeral designs, Gourmet and fruit baskets, Gift baskets, Greeting cards, Plants and more. Mon – Sat : 9:00 a.m. to 8:00 p.m.
Sun : 10:00 a.m. – 7:00 p.m.
Family owned and operated florist in Glendale. Offering floral arrangements and gifts. Local delivery fee $9. For same day delivery in US locations, order before 12:00 noon. Member of Teleflora Network. In-store and online flower delivery available for birthday, anniversary, get well, love & romance, thank you, Christmas, valentine’s day etc. Mon – Fri : 8:30 a.m. to 7:00 p.m. Sat : 8:30 a.m. – 5:00 p.m.
One of the top wedding florist in Glendale, California. The design shop Offers a wide variety of services for any event or occasion including wedding decor & florals, engagement parties, funeral arrangements, birthdays, buffet & cake tables, candy stations, favors & gifts, bridal and baby showers etc. BloomNation florist in Glendale area. A leading flower shop in Glendale and member of FTD Florist network. Offers same day flowers, roses and gifts delivery in Glendale California. Price range from $20 – $200. Buy / order in-store or online. Offers same day flower delivery (take orders until 2pm PST) to any zip code within Los Angeles. And next day flower delivery to certain zip codes within the Greater Los Angeles area. Local flower shop, wedding florist & flower delivery service in Glendale CA.